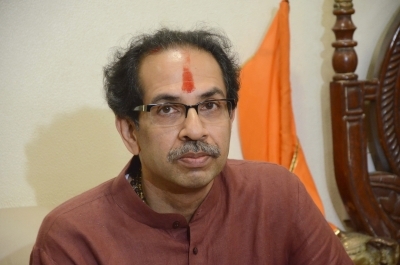 Amravati (Maharashtra), April 16 (IANS) Shiv Sena President Uddhav Thackeray on Tuesday hit out at the Congress for not mentioning the Ram temple at Ayodhya in its 2019 election manifesto. Addressing an election rally here, he reiterated that while the Bharatiya Janata Party-Shiv Sena combine is committed to constructing the Ram temple in Ayodhya, the Congress manifesto makes no reference to this. "Ram mandir must be built at all costs. It figures in our (BJP-Sena) alliance document, but there's not a word of it from the Congress," Thackeray, who had visited Ayodhya for two days last November and demanded that the BJP should announce the date when the temple construction would begin, said. The Sena chief also demanded to know whether the Congress President Rahul Gandhi was planning to strike down sedition laws for the benefit of the "red monkeys" in the Jawaharlal Nehru University. Thackeray said he had requested Prime Minister Narendra Modi to "teach" such a lesson to Pakistan that it dare not cast an evil eye on the country. Dwelling on farmers' issues, he claimed that the BJP-Sena combine had implemented the some of the best policies for the farmers in the country, which never happened during the decades of Congress rules. "All the problems the farmers face in the loan waiver schemes will be resolved... we are committed to that. We shall strengthen the machinery and even approach the banks to ensure this," he assured. Noting that many farmers' daughters had committed suicide as they did not want to burden their debt-ridden parents for their marriage expenses, he said that his party stepped forward and arranged mass marriage ceremonies for them to spare their parents the expenses. "Did Rahul Gandhi ever organise such functions?" he asked. Appealing to the voters, he said: "You have blessed my father, Bal Thackeray in the past, now I seek your blessings. Ensure that we win all the 48 Lok Sabha seats in Maharashtra. "The next time I greet you, it will be in the company of all the 48 BJP-Sena victorious candidates."